One day an advanced alien civilization, weary from years of traveling at light speed down the highways of our galaxy, will finally pull their late model spacecraft into our solar system and decide that the coffee at the rest stop called Earth is as good as any. But I worry that these tourists will decide to land outside a place like Thunder Mountain thinking it’s representative of human culture and then never visit again. Thunder Mountain is the twisted incarnation of either inappropriate medication, or folk art gone wrong. 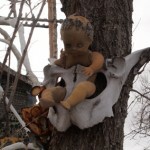 We’ve seen many of these “roadside” oddities, but this one was particularly strange – in person and in story. In 1968, Frank Van Zant at the urging of a medicine woman decided to relocate to the high desert of Nevada with his young family which included his third wife. As the story was told by Van Zant, the Creek Indian woman told him that “in the final days, there shall rise up a place called Thunder Mountain” and here he would survive the apocalypse. Well, apparently, this flat land in the middle of nowhere – nearly 150 miles from Reno – was where he determined this mythical mountain would rise. Once there, he began calling himself Chief Rolling Mountain Thunder and covered the family’s new home – a travel trailer – with concrete. From there, he built a monument to the Creek Indians, his inspiration being fellow “folk artist” Tom Kelly who had built a bottle house only a few hours away. The junkyard nearby made his crazy visions possible and the photos below illustrate the result. The strangest part? Nevada has named it an historic “Indian” Monument? Really? My only hope is that the aliens, if they land here, will give us a chance to show them New York or San Francisco, or even Vegas before they disintegrate us with their ray guns. Creepy pictures, sent chills down my spine…..Looks like something out if a horror movie.